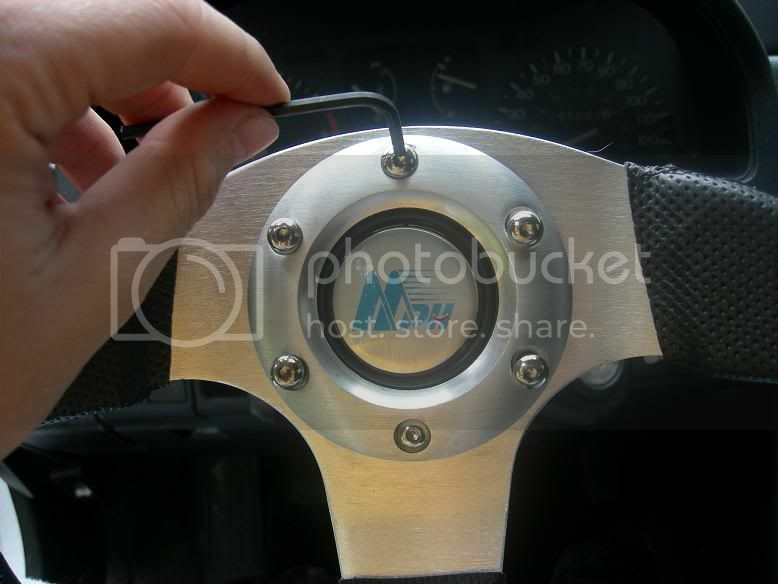 How To: Install an aftermarket steering wheel. Discussion in 'Civic and CRX - EF' started by Andrew, Sep 6, 2006. Have a new aftermarket wheel in your room you want to install, but don't know exactly how? Watch, Read, and Learn. 2. 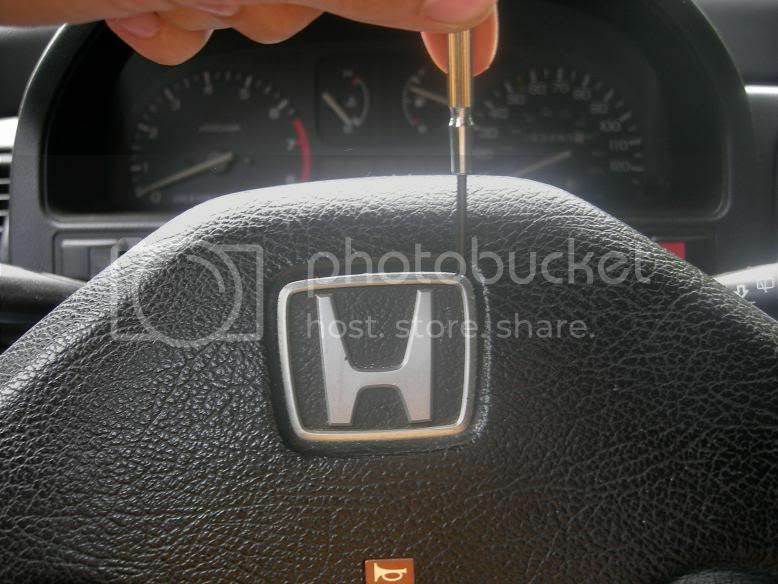 Take your small screwdriver and pop the H emblem off the wheel. 3. 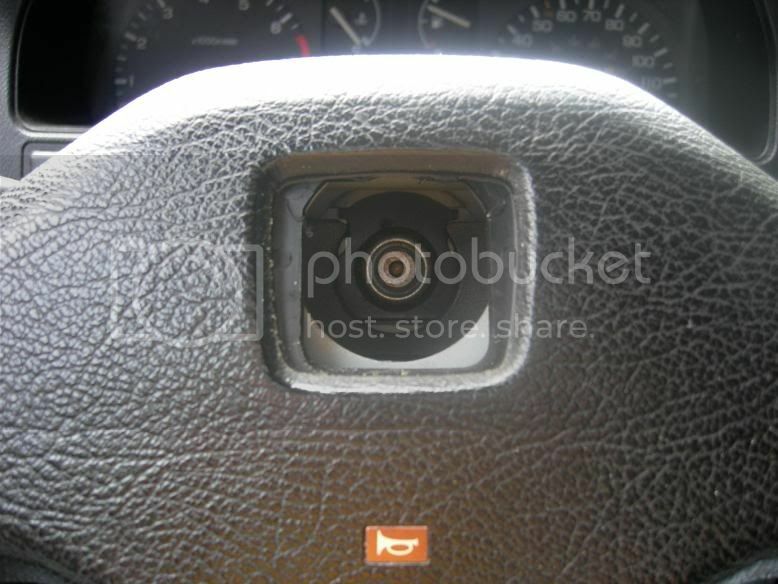 Locate the steering wheel nut. 19mm or 13/16". 5. Zip it out with an impact gun if you've got one. The reason I say use this is because you don't have to worry about the wheel moving very much as you rip the nut off, as opposed to useing a hand-powered ratchet. 7. Then go ahead and pull the wheel off. 9. Slip on the new hub. 10. Bolt down the new steering wheel nut. 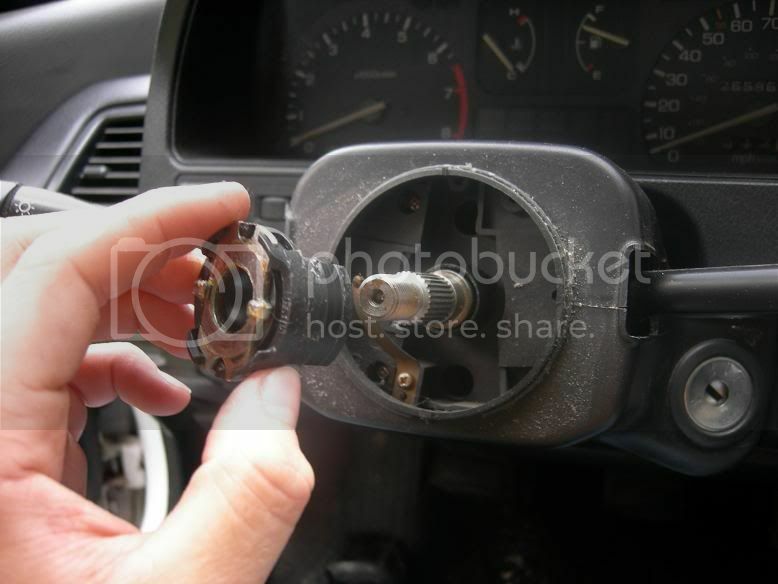 Connect your horn wire, etc and line up the wheel. 11. After you've lined up the screw holes on the wheel/hub, and have made sure the hub, wheel, and screws are correctly lined up. And there you have it. Youv'e completed your wheel install. Good for you! Now your car is more jDm than ever. Look how much smaller my newly installed wheel is. FYI it's a 11" wheel. Thanks for reading my post. Hopefully someone will enjoy looking at the pictures if nothing else. Comments welcome, and don't forget to check my sig for other writeups i've made! That looks like one of those cheap ebay wheels. How is the build quality on it? I was thinking of getting one of them, but I'm hesitant since the real ones cost so goddamn much ($150-200 for a steering wheel?!?!). 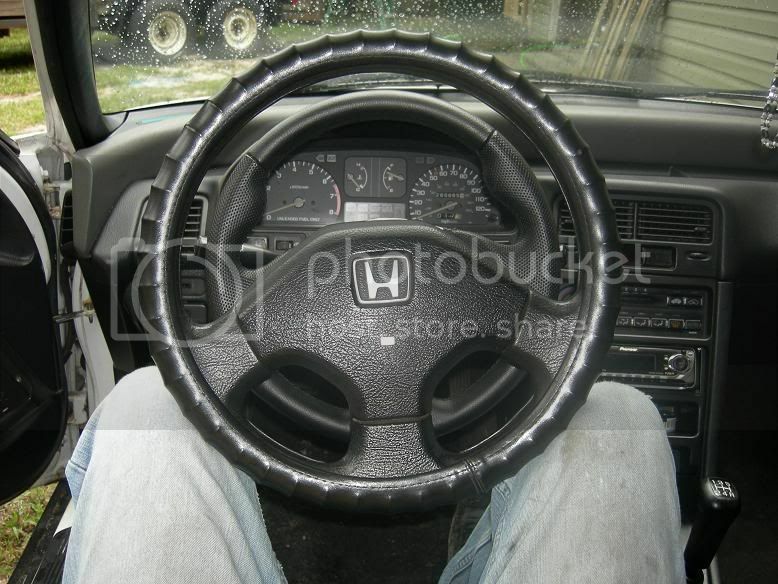 It seems like a steering wheel should be a steering wheel. I don't see how you're paying for anything besides brand name, but hey, I could be wrong. No, I don't think you are wrong. 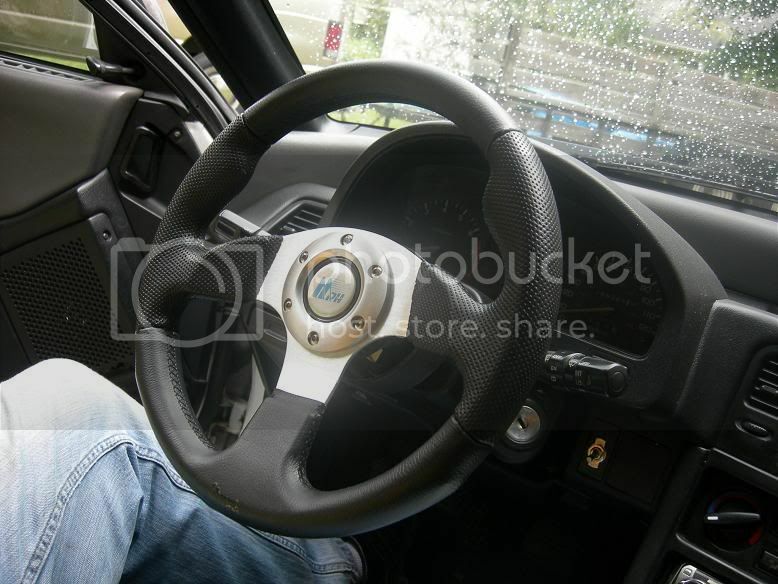 It is in fact an Ebay steering wheel. 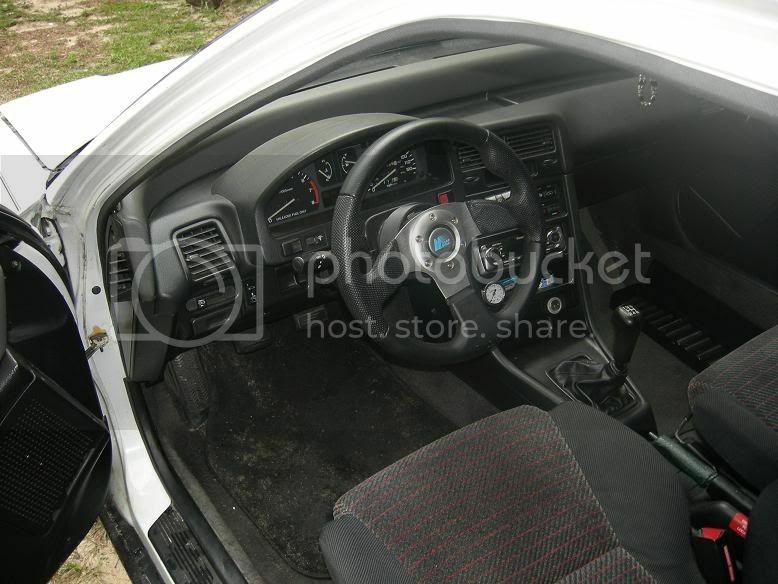 search for a bride steering wheel. I think it's about $25 and about that same price for a hub, so expect to be into it about $50. It feels.... GREAT. it feels like real leather. I don't think i'd ever pay close to $200 for a wheel, when you can buy relativly nice ones for under $100. What size is it? 350mm? Does it make turning signifigantly more dificult? Nope. I wanna say it's 305mm. which comes out to 11.somethin"
It feels like a go-kart. 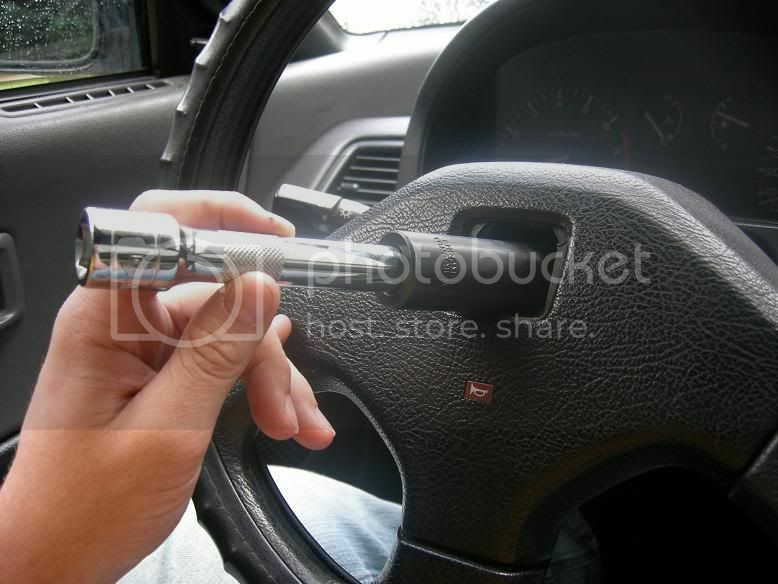 I can turn it NOT MOVING with one hand, just by palming it, so I'd imagine driving it would be a snap. i just remembered that i was going to buy some heavy duty allen bolts [black] from the hardware store and some red locktite for them. nice write up, justa little piece of extra info. 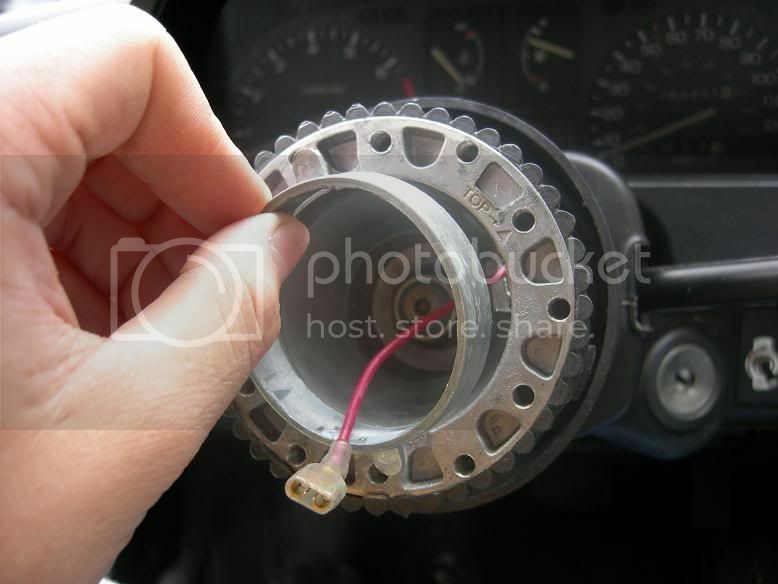 once you losen the nut on the wheel, leve it stil on the thread a couple of turns, then yank, coz if you dont the wheel can suddenly come loose and with out the nut theres nothing to stop your nose from ending up flattter than road kill. ... mine just slipped right off, but I guess I can see how that would happen. 8. 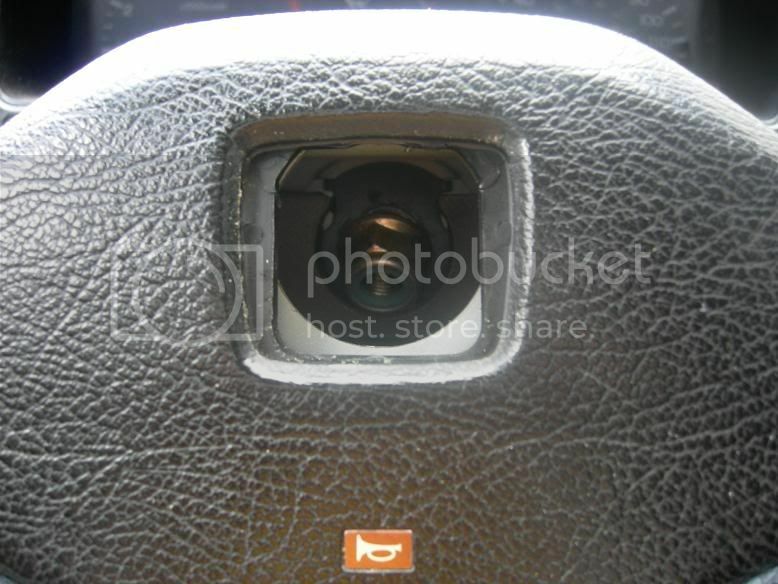 Remove the stock horn switch. It should just be sitting there. 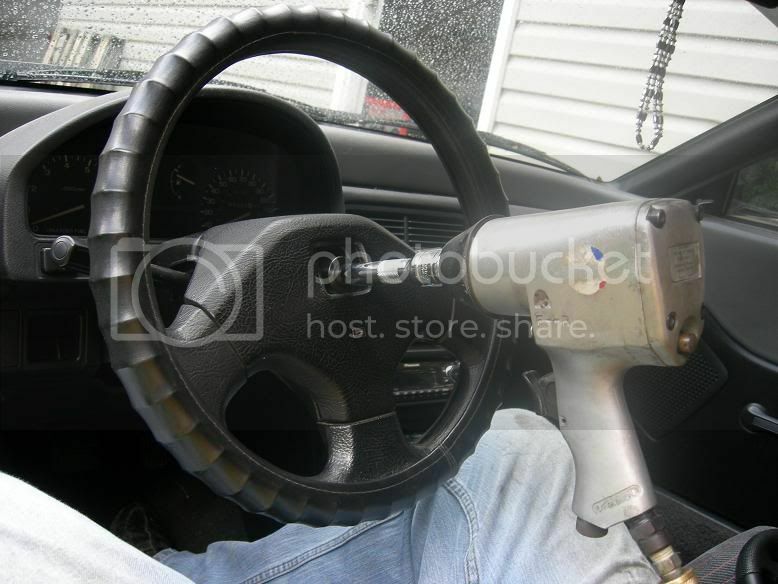 Thats not the horn switch. 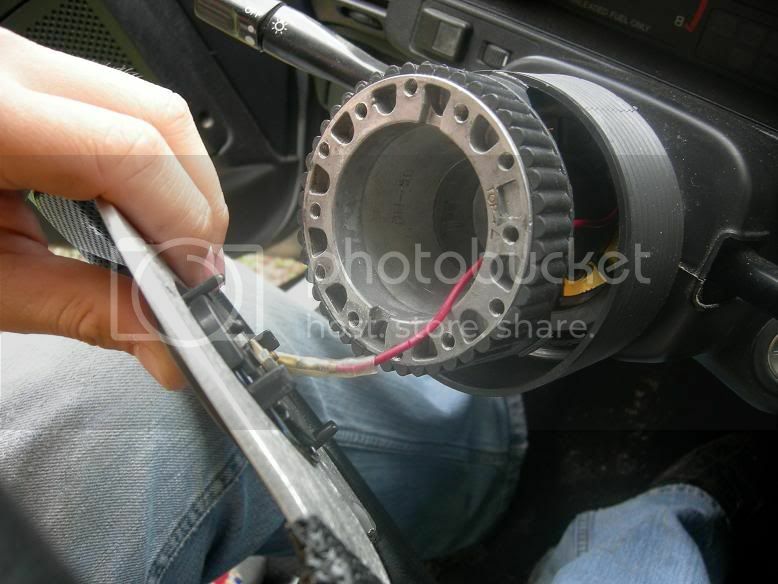 Thats what returns the turn signals back to the OFF position... you might wanna put that back in. I havent driven my car since... so idk. if it is... my bad!! lol! Quick question, could one still use the NRG quick-lock system with this setup, or must it be a quick-release hub? Is that cheaper ebay wheel/hub comobo a quick-release system? Awesome writeup though, very easy to understand! Hmm... I really don't know that much about the quick-lock stuff. I'd assume it's a standard 6 bolt system, but go on NRG's website and see if it's universally compatable. No problem man, it's quite simple to follow! Yeah NRG's website is kinda vague, so I threw a post on here because it would seem someone here has got the know-how or knowledge to answer such a noob question! The website says it will work with any kind of quick-release system, so I'm guessing the cheapo ebay unit isn't quick release, so it likely won't work. I definitely need a smaller steering wheel (6'4", mostly legs ) but the legroom I have is great! 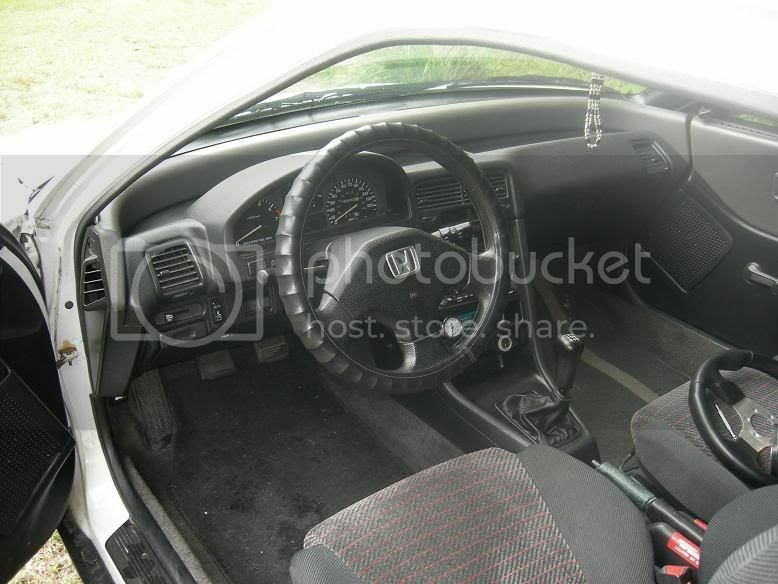 My knees just hit the wheel often, and also having the NRG lock would be great as an added security measure to protect my vulnerable CRX out in the open parking lots of these United States! hmmm double posting huh? i took care of your question for you. again just pm me if you need help or pics. who knows maybe i will do a write up.